Anna Hamil was born in Alabama. She has a degree in Recording Industry Management and a degree in Web Design and Digital Marketing. She has always had a book waiting to come out but had never pursued her dream until teaming up with Jason on writing a children’s book. This is not Anna and Jason’s first project that they have worked on. 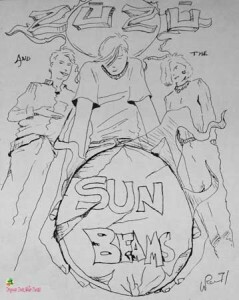 Many years ago in a land far, far away they had a rock band, Zuzu and the Sunbeams, which they wrote all original songs, put in hundreds of hours of practice time, performed live shows and sold cassettes (yes, cassettes. It was that long ago.) to their handful of adoring fans. Jason was the lead guitarist and Anna was the drummer. Going to college in different states put an end to their band dreams. They continued to keep in touch over the years and have been wanting to collaborate on a creative project again. Anna was inspired by the books her daughter got from the Dolly Parton Imagination library. The Imagination Library was founded by Dolly Parton and is incredible program where a free book is sent to a child every month to increase reading literacy. If you are in the Australia, Canada, UK or the US you can register your child for the program. Taking this inspiration and the budding author within, Anna took her idea to Jason. Since we are both familiar with children’s books, due to all of the reading we do for our children and our creative drive, we should try our hand at this. Whether we have a best-selling book or not, we will have a great time working together again.